Ducks Unlimited was selected by the Dewees Island Property Owners Association and the Dewees Island Conservancy to restore 250 acres of wetland habitat for waterfowl, adding birds, shorebirds and marine fisheries. Partner and matching funds were used in combination with a North American Wetlands Conservation Act grant to improve habitat within Lake Timicau on Dewees Island. Dewees Island is a barrier island about 11 miles north of Charleston, South Carolina. The project falls within the CAWS (Cooper, Ashley, Wando and Stono rivers) Focus Area of the Atlantic Coast Joint Venture’s South Atlantic Migratory Bird Initiative. The project is located within the Cape Romain – Santee Delta Region Western Hemisphere Shorebird Reserve Network Sight of International Importance and will protect critical migratory stopover habitat for shorebirds. 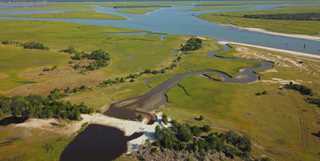 The work included enhancing water delivery canals and installing water control structures to improve water management of the impoundment and increase tidal interchange for these brackish marsh wetlands. These improvements will help managers encourage production of quality forage for waterfowl, provide mudflats and sheet water for shorebird foraging habitat and improve nursery habitat for marine fishes.